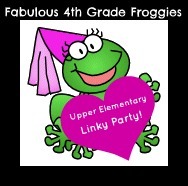 Lorraine from Fabulous 4th Grade Froggies is having a linky party to gather upper elementary blogs. As a 4th grade teacher and former 5th, I heart the upper grades! I’m excited for the opportunity to link up and explore. To participate or simply look around, head on over to Fabulous 4th Grade Froggies!